One of my favourite pieces of makeup is mascara. My obsession really began during my first year of uni, where I could literally sit for hours going up and down and up and down and up and down (you get the picture) with my mascara. I find it really therapeutic. I love the false lash effect but hate wearing false lashes, they feel spiders on my eyes. Sometimes I layer on different mascaras to get the desired look, one for lengthening and one for volumizing. Which can sometimes lead to clump o'clock. The Diorshow serum negates the need for this. The serum claims to comb, curl and coat each individual lash to create a smooth, even mascara base. It is also meant to promote long-term lash growth. I've tried lash primers before but haven't really been convinced. They made my lashes look lumpy and clumpy. But not the Diorshow Maxismizer. I coat my lashes a few times in the white coloured formula, let it dry for a moment, and then go on top with a normal mascara. By the time you have coated the second eye the first eye is ready to roll. The left side is without the dior serum, the right side is with it. 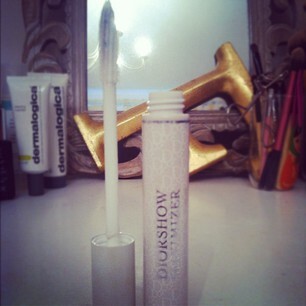 I have applied my favourite mascara on top of the serum (Hourglass Film Noir- a review will be up soon! ), which tbh is pretty amazing on its own at giving volume. However the differences speak for themselves. The serum gives such incredible thickness to the lashes. I coated my lashes twice with the serum and once with my normal mascara. If I was going for a night out I would keep going and going and going, can you sense a theme here? With the use of your serum there is no end to the length you can make your lashes go. I'm not sure as to whether or not my lashes have actually grown using this serum, only time will tell with that one. But in terms of extra length, volume, and definition this product is a must have! I only discovered it a few months ago but I can tell I will now never be without it! Say goodbye to short and stumpy and hello to long and luscious. Look looks amazing! Look forward to the mascara review too.